Note: slight translation/typing errors corrected (31/5/15). You arrived in Israel in the mid-1980s, and now, 38.5% of families from Ethiopia live below the poverty line, against an average of 14.3% for all Israeli Jews . You are only 2% of the Israeli population, yet you are 40% of prison inmates. You’re pejoratively called the “Falasha”. Since your childhood, you have suffered mockery, beatings and moral violence because your skin colour is not the same. Because you’re “bad Israelis” and “bad Jews”. But these days, you are no longer simply collateral damage of the old dreams of the movement of “national liberation” or Zionist expansionist Israel today; you are no longer mere victims – you hurt fifty cops, attacked the town hall with stones, and although the mounted police fired stun grenades to disperse you and to protect the municipal building of Tel Aviv, you blocked one of the country’s main motorways. It’s not so much the actions that count, but your determination to break the silence in which nationalism, capitalism and its various determinisms keep you. The interior minister (Yitzhak Aharonovitch), explained that scattering the “rioters” was complicated, because there was no leader to turn to, and that’s where all your strength and courage was. Leftists have already abandoned you even after having supported you in the past  as in all cases of leaderless revolts throughout the world. 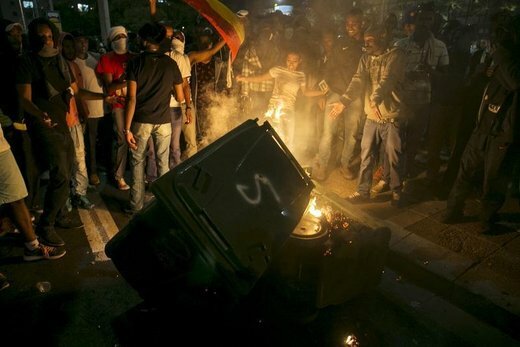 There are quite a few self-appointed leaders of the Ethiopian Jewish community who condemn the riots and who talk about an “anarchist” conspiracy . This is the video which set alight the powderkeg which propelled you into the streets by the thousands – we see an Israeli soldier of Ethiopian origin being beaten for no reason (though he resisted) in the street by two racist police testing their Krav Maga. 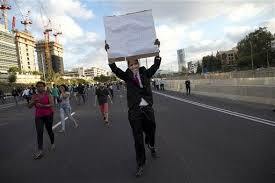 Images that inflamed the streets as others ignited American streets in recent months. Images that refer to everyday racism and exploitation that many non-Jews also face: Israeli Arabs, migrants from Asia and sub-Saharan Africa. 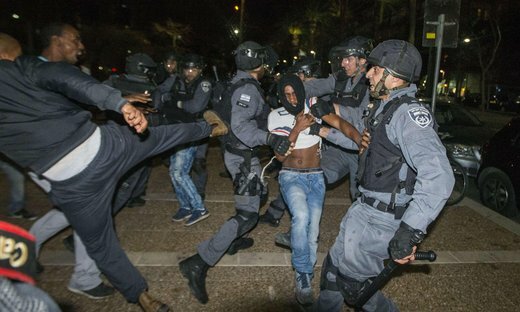 Israel, Tel Aviv: conflicts between Ethiopian Jews and cops continue “…protesters threw rocks and glass bottles at police, who responded with stun grenades and fired water cannons at protesters. As of midnight Sunday, almost 50 people were injured. 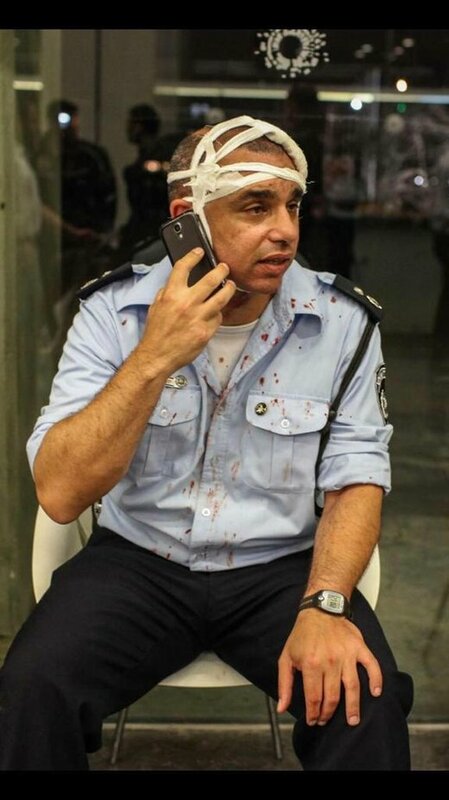 According to Israel Police spokesman Micky Rosenfeld, 23 of them were police officers.” More here “Israeli mounted police charged hundreds of Ethiopian-Israeli citizens and fired stun grenades on Sunday to try to clear one of the most violent protests in memory in the heart of Tel Aviv. The protesters, Israeli Jews of Ethiopian origin, were demonstrating against what they say is police racism and brutality after the emergence last week of a video clip that showed policemen shoving and punching a black soldier. 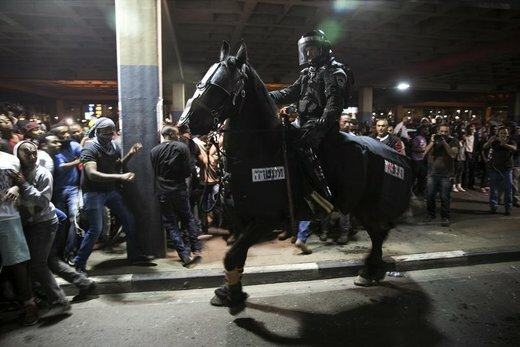 Demonstrators overturned a police car and threw bottles and stones at officers in riot gear at Rabin Square in the heart of Israel’s commercial capital. … tear gas was also used, something the police declined to confirm. “I’ve had enough of this behavior by the police, I just don’t trust them any more … when I see the police I spit on the ground,” one female demonstrator who was not identified told Channel 2 before police on horseback had charged. Earlier, demonstrators brought evening rush hour traffic to a standstill for over an hour by blocking one of the city’s main highways. …Tens of thousands of Ethiopian Jews were airlifted to Israel in dramatic, top-secret operations in the 1980s and 1990s after a rabbinical ruling that they were direct descendants of the biblical Jewish Dan tribe. The community, which now numbers around 135,500 out of Israel’s population of over 8 million, has long complained of discrimination, racism and poverty. Tensions rose after an incident a week ago in a Tel Aviv suburb where a closed circuit video camera captured a scuffle between a policeman and a uniformed soldier of Ethiopian descent.”…Netanyahu says “…there is no place for this type of violence” – we know the type he colonises several places for. i liked the piece and was gonna share it on my network until i read footnote #2. I’ll check out the link later. Wasn’t personally intended to put you down (I know very little about you) – it was just a translation of the original non-fides footnote. In 2016, according to Israel Prisons Service (IPS), out of a total of 20,568 inmates, 5,659 are Jewish; more than twice that number, 12,397, are Arab; and 2,512 are classified as “other” – including asylum seekers held in detention camps, as well as a handful of non-Israelis who are neither Jewish nor Arab. I could not readily retrieve a figure to ascertain what proportion of Jewish prisoners in Israel are of Ethiopian origin but assuming that the whole Jewish prison population was of Ethiopian descent, and none were Oriental or European or mixed or other, than the Ethiopian portion still only represents 25% of the whole prison population in the State of Israel. Assuming your figures are correct for 2014-15 (the riots were in 2015, remember – not 2016), the article might be referring specifically to Israelis in prison. I know there are many Arab Israelis but maybe the figures also refer to non-Israelis in prison. And probably it didn’t include “detention camps”.